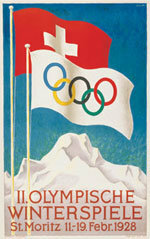 The Second Winter Olympic Games were held at one of Europe’s most exclusive winter sports resorts, St. Moritz. The weather conditions were very difficult with up to +25 °C. A drying foehn wind contributed to the cancellation of the skating 10,000 m.
The Norwegian skier Johan Grøttumsbråten distinguished himself by taking gold in both 18 km and Nordic combined, while Sonja Henie won her first Olympic gold medal.